Hui’s World ! – An Excel Project of Global Scale. For more posts visit Archives or Home page. 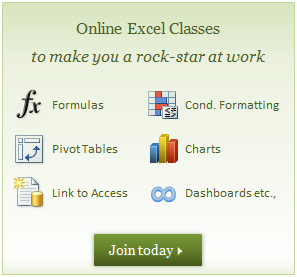 At Chandoo.org, I have one goal, "to make you awesome in excel and charting". This blog is started in 2007 and today has 350+ articles and tutorials on using excel, making better charts. Read more. Think... is it really random? So, i can see, it's a simple and effective solution. ??? I've never used Power BI (apparently it's an add-on for Excel, but I have not bought or downloaded it.) This doesn't appear to do anything but make you scroll through dates and/or click on sections of the heat map. Can anyone tell me what this should be doing other than showing me different shades of red? Thank you too! Happy Easter! Is it possible to include a mailmerge field in the file name? e.g Document For [Jeff] Jeff being the name of the person the letter is being drafted for. So in my destination folder I can just generate as many as I want without fear of the file being over written. Just In Time! I was about to write to Microsoft today morning requesting to include "CONCATIFS()" function in next update - to club multiple match entries for given criteria(s).. Never knew this "TextJoin" function.. Thanks a lot..! Awesome as always @Chandoo! Ps: I started making my living by doing Microsoft Excel Training to corporates, part-time - and base for that gyan is mostly from chandoo.org! Hope u wont ask me any royalty and I refer your website for any queries :) ..
Fabulous tips! For many years, I have been using nested INDEX and MATCH (exact) functions to extract records (often with the conditional IF function) , usually using Named Columns, which I find a preferable method to the VLOOKUP and HLOOKUP functions (where column and row location can be dictated). The named ranges are important to me, so that the formulas are interpretable regarding intent. This new TEXTJOIN function for the recent versions of Excel will be very helpful. Hi Chandoo. I learnt vlookup from you a few years back and had been very happy using it, with all its drawbacks. It always helped, and where it couldn't, like looking to the left, I still managed by manipulating my data. But recently I stumbled upon DGET and life has changed since. It handles multiple criteria and fills up all gaps of vlookup. DGET is my new favourite now. Nice collection of article, so inspiring and easy to read, keep posting thank you for sharing Have a Nice Day! Looking for a function that will match names to tracking numbers of customers from two lists and sort them. Is this possible? This is a nice technique but I was wondering if I wanted to use the data table for other calculations the line item does not line up with the ABC classification. Is my understanding correct that the graph ignores the relationship between a line item and its class and instead looks at cumulative totals/classification independently ? I can't see full page from my mobile. It's not mobile responsive. Please check.